This 1979 Aladdin metal-Disney Black Hole Lunch box does NOT include the Thermos, lunch box has been used has some scrathes and rust, small split in metal where latch is, still has thermos latch inside, has 1 sticker applied inside, overall in good shape. $14.95 In Stock (ONLY HAVE 1) This officially licensed I Dream of Jeannie retro tv style metal tin box is near mint, looks just like an old style tv, tin is about 7 3/4" long by 5 1/2" tall and 3" wide at the bottom has a silver chrome plated handle that looks like an old antenna, was made by Vandor in 1999. 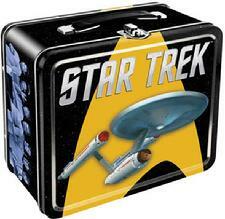 Item #48120 Classic Star Trek Retro Metal Lunch Box Tin $15.95 ea. In Stock This new metal classic Star Trek retro lunch box is near mint, never been used, is 7 3/4" long by 4" wide by 6 3/4" tall, full color graphics, NO THERMOS, with plastic carrying handle, officially licensed. 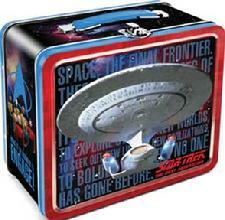 Item #48088 Star Trek-The Next Generation Metal Lunch Box Tin $15.95 ea. In Stock This new Star Trek-The Next Generation-U.S.S. Enterprise NCC-1701-D metal lunch box is near mint, never been used, full color, is about 7 3/4" long by 4" wide by 6 3/4" tall, comes with plastic carrying handle, No thermos, officially licensed. Item #155 The Land of the Giants Metal Re-production Lunch Box $19.95 ea. In Stock This new Tin10 metal Land of the Giants lunch box is mint, full color, limited to only 5,000 pieces, still shrink wrapped, never been used, full size re-production almost 8" long by 6 3/4" tall by 4" wide, NO THERMOS, officially licensed by Irwin Allen productions. Item #48081 Classic Star Trek-U.S.S. 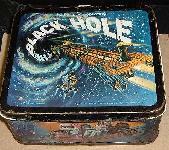 Enterprise Metal Lunch Box Tin $15.95 ea. In Stock This new Classic Star Trek U.S.S. Enterprise NCC-1701 metal lunch box is near mint, never been used, is officially licensed, comes with a plastic carrying handle, No thermos, is about 7 3/4" long by 4" wide by 6 3/4" tall. Item #48091 Friday the 13th. Metal Lunch Box Tin $15.95 ea. In Stock This new Friday the 13th. meal lunch box is near mint, never been used, is about 7 3/4" long by 4" wide by 6 3/4" tall, officially licensed, has a plastic carrying handle, No thermos, full color. 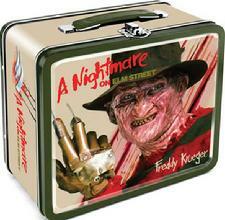 #Item #48092 Nightmare on Elm Street Metal Lunch Box Tin $15.95 ea. In Stock This officially licensed metal Nightmare on Elm Street metal lunch box is near mint, never been used, is full color and is about 7 3/4" long by 4" wide by 6 3/4" tall, comes with a plastic carrying handle, No thermos. 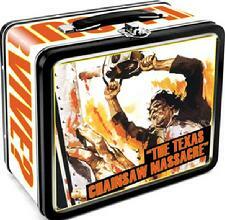 Item #48074 Texas Chainsaw Massacre Metal Lunch Box Tin $15.95 ea. 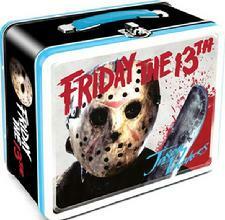 In Stock This new, Texas Chainsaw Massacre metal lunch box is near mint, side panels has the phrase "Who will survive?" in blood red, full color, never been used, fully licensed, is about 7 3/4" long by 4" tall by 6 3/4" tall, comes with a plastic carrying handle, No thermos.